“The Bermuda pink sand beach experience must be iconic, memorable for its natural beauty complemented by cleanliness and casual amenities that are culturally authentic,” according to the Bermuda Tourism Authority’s Beach Economy Vision. 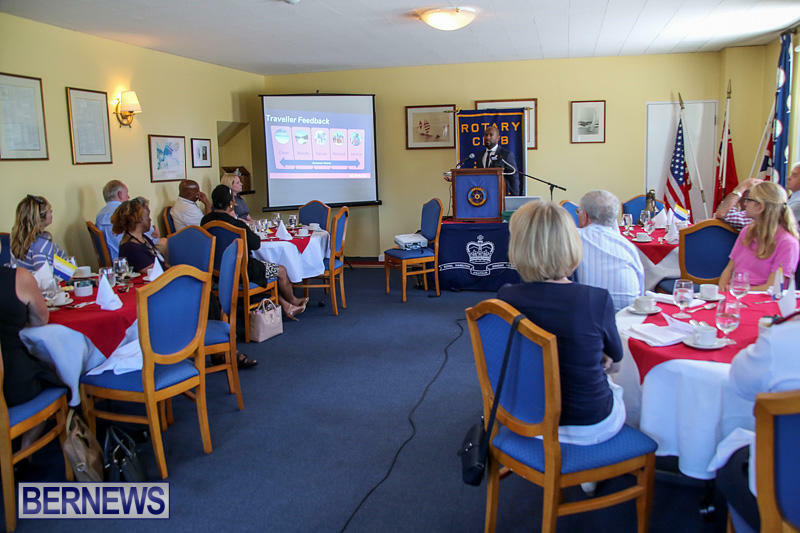 The island’s “Beach Economy Vision” was the subject of today’s [May 10] presentation to the Hamilton Rotary Club, with attendees hearing from the BTA’s Director of Public & Stakeholder Relations Glenn Jones, the BTA Director of Research & Business Intelligence Erin Smith and Craig Burt from the Department of Parks. What a bunch of waffle. Get the tourists on the beach and let them enjoy some rum! And de CEO STILL gets $1,000 a day!!!!!!!!!!!!!!!!!!!!!!!!!!!!!!!!!!!!!!!!!!!!!!!!!!!!!!!!!!!! A lot less than other CEOs in Bermuda ! Are other CEO’s being paid from Public Funding. Yes….the BHB CEO for one. The same salaries that Zane Desilva of the PLP refused to release while in power. The same ones that will now be made public under the OBA within the next month or so. the vision is weak IMHO. we have all of these pretty pretty presentations, but some of the people in these positions of authority, marketing, PR, etc are not the boots on the ground individuals that we need on the job. we THINK they are the best thing for tourism but they are definitely not. they justify their pay cheque but the results haven’t shown. the DIFFERENT approach that is so much desired is seldom achieved because we have delusions of grandeur whilst our relatives to the south keep the KISS approach and have double our figures relative to their occupancy capacity. I think jumping off de cliff was more inovative. Congratulations to Bermuda Tourism Authority for focusing on a beach economy vision and coordinating a consistent plan for these five beaches involving stakeholders, visitors, locals, relevant departments including environmental organizations. Bringing up the standards at these five beaches. And thank you to Rotarian George Cook who brought up the problem of cigarette butts littering the sand. KBB is happy to play a small role in beach improvement.